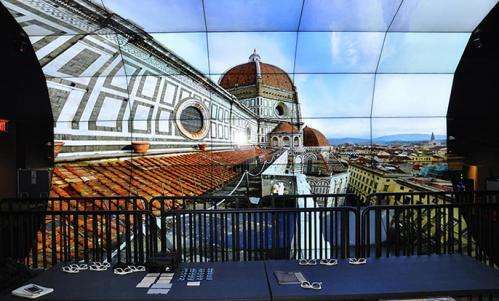 The "patient" in question is the Baptistery of St. John, a basilica that sits in the Piazza del Duomo, adjacent to the famous Florence Cathedral (known colloquially as "The Duomo"). The students, structural engineering Ph.D. candidates Mike Hess and Mike Yeager of the Center of Interdisciplinary Science for Art, Architecture and Archaeology (CISA3), had been invited by the Museo dell'Opera del Duomo to conduct a structural "health assessment" of the building, which was completed in 1128 and was the site where the Italian poet Dante and many other notable Renaissance figures were baptized. Their resulting 3D digital model depicts a building that has aged gracefully, yet warrants careful and continued evaluation—not surprising considering the Baptistery has experienced several hundred years of settling and is situated in a seismically active zone. But there were indeed big surprises in store for the team, surprises that might have gone unnoticed were it not for the "high-tech gaze" of the advanced multi-spectral, high-resolution tools they used to see behind walls, underground and directly into the past. Before they could look into the past, the team's first order of business was to create an accurate record of the Baptistery's current condition. 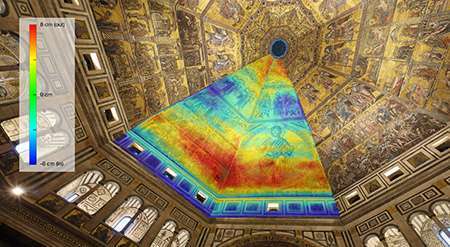 Using LiDAR (light detection and ranging) laser scanning, ultra-high-resolution photography and thermal imaging techniques, Hess and Yeager constructed a comprehensive 3-D model of the interior, exterior and facade of the 5,500 square foot Baptistery. The result includes stunningly realistic 3-D models of the Baptistery, its marble sarcophagi and baptismal font, computed from thousands of photos using photogrammetry techniques. Those techniques are spatially referenced to the one-and-a-half billion 3-D data points captured by the LiDAR scanner. 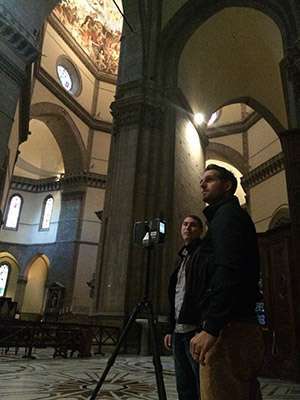 CISA3 students Mike Hess (left) and Mike Yeager constructed a comprehensive 3D model of the interior, exterior and facade of the 5,500-square-foot Florence Baptistery as well as certain areas of the Duomo. In addition to the remarkable discovery of the Roman rooms, Hess and Yeager also determined from their scans that the floor above the excavation site differs dramatically from that above the unexcavated ruins—but not in the way one might expect.